Click on each resource to download. 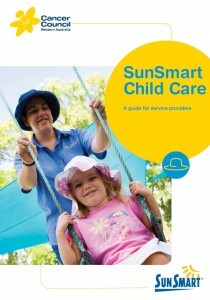 SunSmart Child Care: A guide for service providers. This resource includes templates for policy and shade development, SunSmart education information, funding tips and fact sheets for parents. Suitable for occasional child care, long day care, family day care, out of school hours care of vacation care. 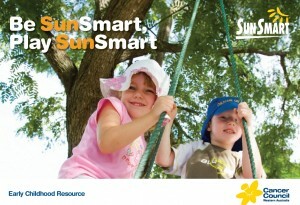 Be SunSmart, Play SunSmart: Early childhood resource book. This 28-page book has been designed for early childhood educators and includes information about sun safety in child care. It also provides ideas for SunSmart play experiences. 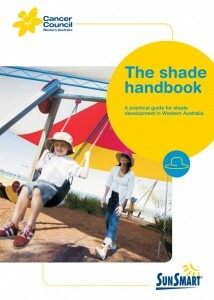 The Shade Handbook: A practical guide for shade development in Western Australia (2012). A 38-page resource developed for individuals, organisations and local governments to increase the provision of quality shade. The Shade Handbook: Supplementary materials. 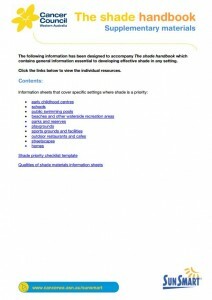 These information sheets are designed to accompany the Shade Handbook and detail specific shade recommendations for a range of community settings, including child care services.